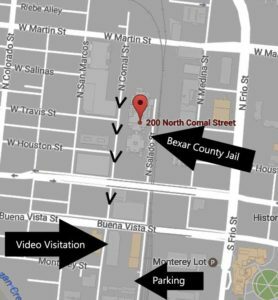 How to find video visitation and parking. Click to enlarge. In the part of the website for info about visitation, it says that the first 5 days an inmate is there, his visitors don’t need his sid number to visit him. Does this mean that the first 5 consecutive days he can have visitors? ( like the first 5 days in a row, everyday can he have visitors?) or is it the first 5 days I can visit? Jill – This site does not say that during the first five days visitors do not need an inmate’s sid number. It says that during the first five days visitors do not need to be on the inmate’s visitation list. Only immediate family is allowed to visit during this time. The inmate can only get two visits during his first five days. Can I call Central Records at anytime? Like, Is it 24 hour or are there specific times I have to call? Jessica – Central Records is 24/7. My husband just went in a week ago for me to visit him do I just go to the jail he is in? I mean say he is in the annex do I just go there or do I have to go to the main jail? Mandy – If he is in the Annex then his visitation is at the Annex. Is visitation face to face or is it over the phone and camera? Ashton – Glad you brought this up. Currently visitation is face-to-face through a plexiglass but we hear that a video visitation is being set up. We’re not sure when that is going to be functioning. If you have a warrant in Comal county, can they see that at the jail at Bexar county? Ashton – It depends on what kind of warrant. Traffic ticket, probably not. Anything above that, yes as long as the agency holding the warrant entered it into the system.